Do you really want to sit through another dull, gray, lackluster presentation? Nobody does. 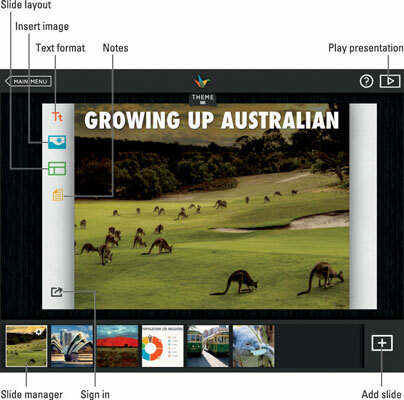 Haiku Deck is the perfect iPad app to help teachers or students develop engaging, image-based presentations. Tap to open the Haiku Deck app. Tap the + icon on the bottom toolbar to start a new presentation. You’re prompted to type a title. The presentation editor opens and the top row presents you with a collection of themes. Each one uses a different font and color scheme. Tap to select your choice of theme; then tap the slide editor in the middle of the display to start creating the presentation. Add slides, text, and images. Edit text. Tap the default title or subtitle fields to insert your own text. Search for images. This is the trademark feature of Haiku Deck. Tap the Insert image icon in the left column. 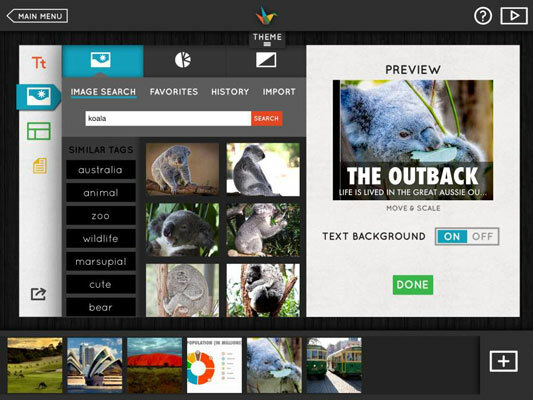 Type a search term and Haiku Deck displays a grid of matching images along with a list of similar tags if you need to alter your search. Some images have a small dollar sign icon. Those are images that require a fee for use. There’s a huge range of free images, and if you only want those displayed, you can turn off the Show Premium Images option in Settings on the opening app display. Import images. Tap the Insert Images icon and then tap Import to insert images from your iPad’s photo Library or from your account on services such as Dropbox, Flickr, Picasa, and Google Drive. Change slide layout. If you find that the text is covering part of a background image, tap the Tt icon in the left column and select an alternative layout from the options displayed. Add notes. Just because Haiku Deck gives you the tools and images to create stunning visual presentations doesn’t mean you can’t include additional details as text. Tap the Notes icon next to any slide to add details and links to other resources. 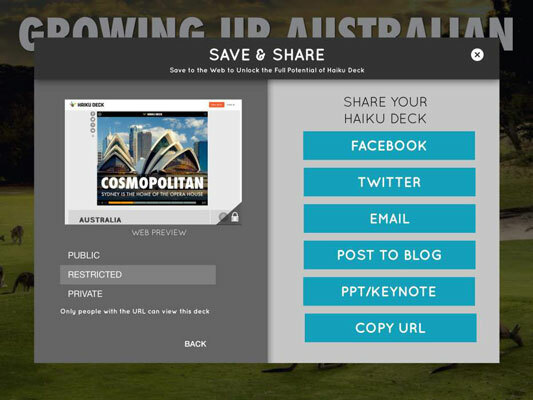 Consider the scenario where you have students submit their Haiku Deck to you as an assignment. The Notes feature is a great vehicle for adding academic rigor. Notice also that Notes can be private or public — something to keep in mind if you decide to publish your Haiku Deck, as outlined later in the description of the Share option. Add and organize slides. Tap the + icon in the bottom-right corner to add a new slide. If you want to move a slide, tap and hold it in the slide manager as you drag it to a new position. Tap it once and a Settings icon appears with options to copy or delete the slide. Play. This one is simple. Get your popcorn and then tap the Play icon to watch your presentation full screen. Swipe to move between slides. Tap the Pencil icon in the upper corner when you’re ready to return to edit mode. And don’t make a mess with that popcorn. Share your Haiku Deck. Your Haiku Deck is saved on the iPad, but you need to create an account if you want to share or publish it. Tap the Share icon in the left column and create your account or sign in. You can also elect to create a single class account that you share with students. You can tap Share to get the list of available options. Note the Change Privacy option. Presentations can be set to Private, Restricted, or Public. Restricted and public files are uploaded to your account on the Haiku Deck website and given a unique URL that can be shared or e-mailed. Restricted presentations can only be viewed if you have the URL, whereas public files are also listed in the public Haiku Deck Gallery. In the case of private presentations, you may want to use the PPT/Keynote option, which converts the file and sends it via email.